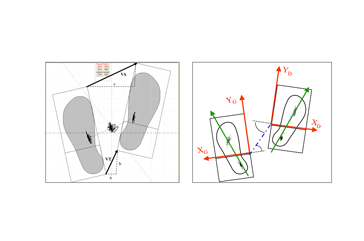 Video modeling of the inverted pendulum from M. Hugon and M. Ouaknine. 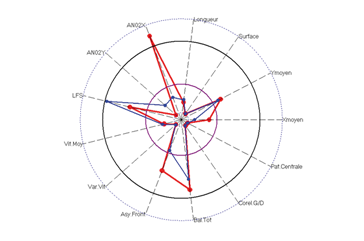 Cyber-Sabots ™ system stabilometric most recognized and well validated by the international scientific community. 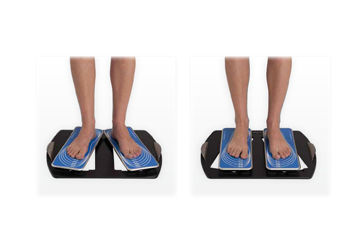 The use of two dynamometric platforms, one for each foot, gives access to quantifiable roles musculature ankles and hips in the control of the balance of the subject. 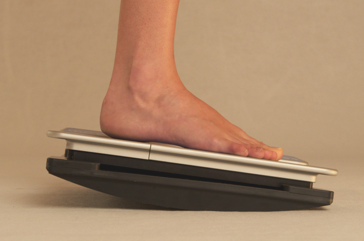 These platforms monoplate patented Super-thin and very light meet the metrological requirements of the French Association of Posturology (AFP Standards 85/2000). Their use is perfectly compatible (backwards compatible) with standard platforms. This novel approach in posturology opens new concepts, methods, evaluation of descriptors for finer postural control. Fully machined from a solid block of aircraft alloy, the design of Cyber-Sabots ™ are characterized by exceptional mechanical properties: stiffness, compactness, light weight and reducing thermal stresses. 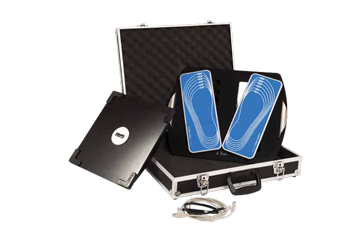 Several colors are available anodizing Specially designed, the lining of the sole is designed to ensure both thermal insulation and isolation, and enable the other hand, with silkscreened markings, proper placement of the feet of the patient according to his size. 3) Maintenir la hauteur de la sole plantaire au sol à 60 mm. 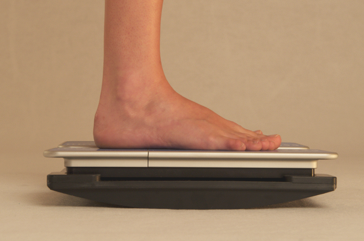 To be comparable, measurements must be made under specific conditions, notably with regard to foot position: angle of divergence (30°) and distance between heels (2 cm) as defined by the AFP-85 standards, or parallel (0°) as defined by the portuguese school. You can choose engines "unbalanced" depending on the size, intensity and frequency of vibration applied. Motors, brushless have a great life. The electronics within the motor, allows frequency tracking to less than 1% error. The control units (and UNIT_VIB2 VIB4) controls two or four motors. In program mode, the computer takes control. It should be noted that the analysis software Cyber-Sabots, has a window for setting stimulation synchronously with the registration stabilometric, time, duration, frequency, frequency profile .., 1 to 4 engines. Ce logiciel, construit sur une expérience de plus de 20 ans, reprend tous les descripteurs standardisés des normes AFP 12/05 et AFP 40/16. En plus de paramètres normalisés, SABOTSOFT offre un large éventail de données, voici quelques graphes spécifiques illustrant la puissance de SABOTSOFT. Wavelets are a method of time-frequency representation of the signal stabilometric. This is kind of a FFT on a rolling window of the signal. Its representation must be three-dimensional (time-frequency-intensity). Generally, preferred representation in a plane. The intensity is represented by a color according to a convention: the color temperature for example. 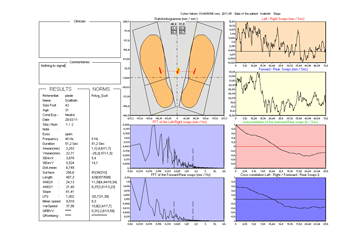 The following figure shows the wavelet compared against trips sagittal both feet .. A tremor of 6.62 Hz, confirmed by the FFT superimposed appears only under the right foot. This representation is useful for analyzing a sequence posture. 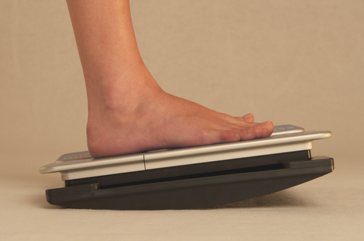 - Investments means of partial and overall reported STKG feet. - Distribution of forces in the 4 podal support. 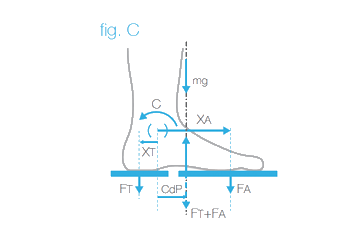 - Concept of supporting foot, walking motor, foot pillar and foot steering. - Appreciation of the amplitudes of excursions in the 2 directions of oscillations (surface and shape of the ellipse). - Comparison of parameters in both conditions. - Appreciation (slope of the ellipse) of the Directorate General average oscillations. SabotGame is for postural rehabilitation by biofeedback on a standard platform on Cyber-Sabots ™ on Bi-Pod and astable dynamic platform type "BESSOU." 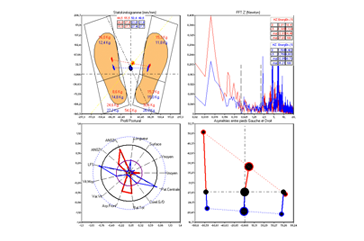 The purpose of this program is to provide rehabilitative information about visual and audio related to the placement of the center of pressions.Tous patient results are presented in tables and graphs. 16 types of graphs are available. 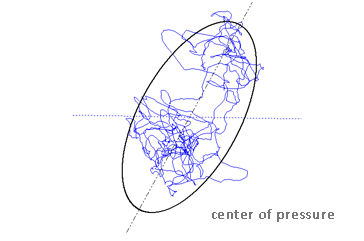 By a procedure Ad-Hoc SABOTSOFT is able to approximate the mass center (red) from the center of pressures (in blue). 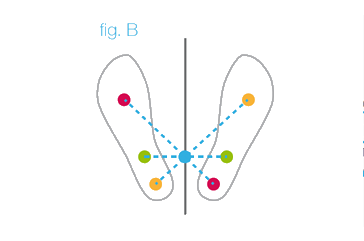 The superposition of the two curves shows the mechanical effects of pulse tricipitales necessary to restore balance during phases of falling and increases the center of body mass. 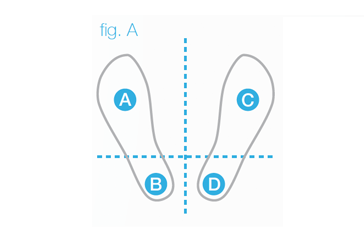 Diagram asymmetries investment means the COP. The normative reference position is given by the statistical average center of pressure of population control. 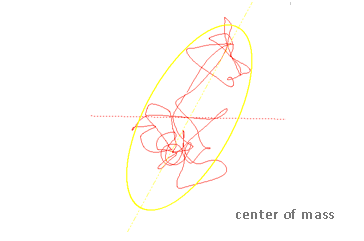 Differences in position and direction vectors are given by taking as origin the point end as normative and actual placement of the center of pressure. Inter-correlation AP / ML reveals a possible correlation between the AP and ML oscillations. If this function has a speed and ample pseudoperiodic (fig. left), the movements are anticipated and expressed their determination. It may soon be in a simulator. In this case, the cross spectrum (Fig. 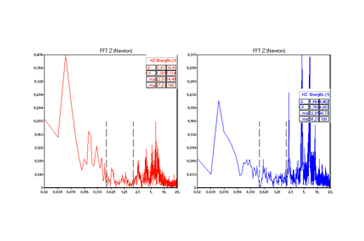 right) exhibits an interaction energy greater than 60% in the band 0.3 Hzhe AP / ML. Postural Profile © is a synthetic representation of a patient's postural assessment descriptors postural instability is a mass of information is increasing, and in which the clinician may be lost. Profile postural we propose here is a synthetic scheme to assist the interpretation of posturogramme. 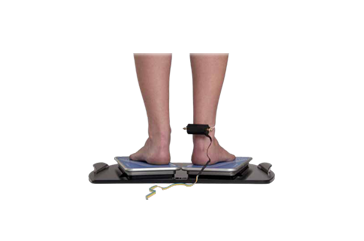 This mode of representation, says a glance parameters that allow you to enter into the logic of postural control by describing its accuracy, energy expenditure, its symmetry, its muscular tensions, its degrees of freedom its reports to the various sensors. 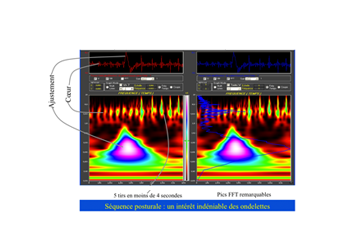 SPECTRUM OF FORCES VERTICALESLa FFT of the resultant vertical forces (Z (t)) is sensitized to the speed and acceleration of vertical movements of high frequency. Some tremor or invisible FFTX FFTY are revealed and come to support a diagnosis of certain neurological disorders. This figure, showing a large peak around 7 Hz confirms the neurological pathology. The "package" is offered with theoretical training and the use of Hooves. This training is tailored to the needs and achievements. We regularly organize training according to the evolution of hardware and software. Remote assistance is available with an optional remote control for your equipment.